Israel ben Eliezer. A Jewish mystical rabbi. "Master of the Good Name". 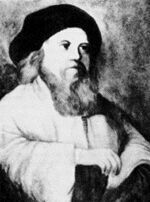 The founder of Hasidic Judaism. (1698-1760 AD). "The world is new to us every morning - this is God's gift; and every man should believe he is reborn each day." "If you want to belittle anyone, belittle yourself. It you want to praise anyone, praise Hashem."